Germany has always fascinated me. It has given us the genius of Karl Marx and the horror of Adolf Hitler. It has given us Beethoven, Brecht and Nena. So, this spring, I took the plunge to spend two weeks in Germany, to explore some of the country and culture that has so influenced Europe and the world. 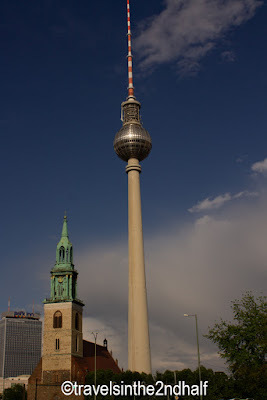 My trip started in Berlin, which I quickly fell in love with. Berlin met my criteria for a really good city, it has a lot of cultural activities, a good sports team, and, most importantly, it is easy to navigate by foot. In fact, Berlin ranks with New York, Barcelona, and Paris as being one of the most walkable cities I have visited. While Berlin has its tourist center – the Mitte, that area is surrounded with living, breathing neighborhoods. My hotel, The Wyndham Garden Berlin Mitte, a misnomer as it is not in the center of the city, was on Osloer Strasse, in the Gesunbrunner district. The hotel is an old factory that used to build machine parts and equipment. The building has been completely renovated and it served as an excellent base for my stay. Gensenbrunner is about 5.5 Km (3.5 miles) from the center of the city. 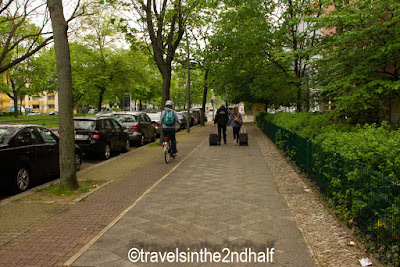 Staying at the Wyndham gave me the option of walking to either the S-Bahn or the U-bahn, each about 15 minutes away on foot, or taking the trolley line that runs right in front of the hotel. One reason that I enjoyed my stay is that the hotel is in a neighborhood of working and middle-class families. This meant there were always people out on the street and in the cafes, so I always felt safe, even coming home from the opera at around 11 PM. It also gave me an abundance of eating options, from donar shops to full service restaurants, and at prices much more reasonable than in the Mitte. Truly, I felt safe throughout Berlin. 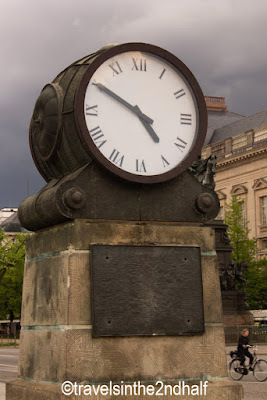 That is not to say that there aren’t warnings of pick-pockets in the center of the city, but I traveled as an obvious tourist, tee-shirt, jeans, camera bag and back-pack, and I never felt that I drew undo attention. The first major walk I took went through the heart of the city. It was suggested by Rick Steves in his guide book for Germany. 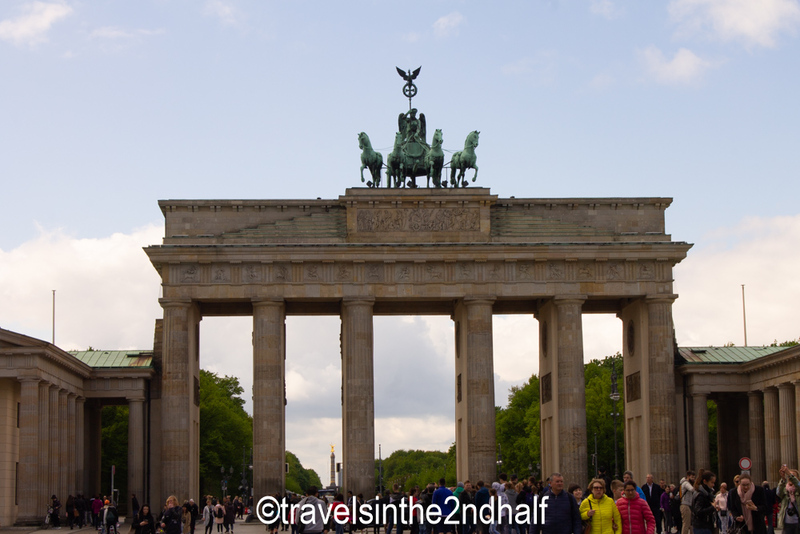 It starts at the Reichstag, passes through the Brandenburg Gate, and then goes along the Unter der Linden to the Hecksher Markt. 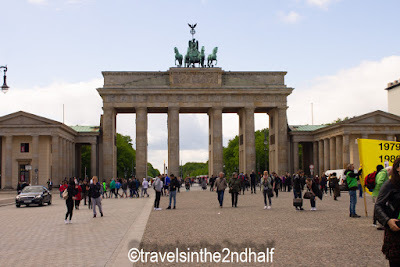 This one-and-a half mile walk takes you past many of the major tourist attractions in downtown Berlin and it is great introduction to the city. You start at the Reichstag, home to the Bundestag, Germany’s governing body. 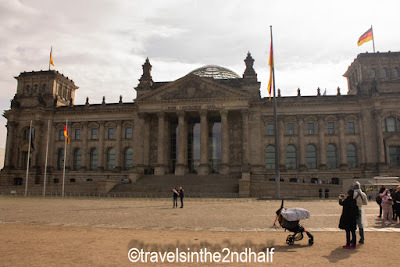 I will have a lot more to say about the Reichstag in a future blog, but it is worth visiting. You have to reserve tickets to get in, either on-line (at least 2 weeks ahead of your visit) or at the visitor’s center across the street from the Platz der Republic (2-4 days before your visit). You CANNOT just show up and get tickets for that day, it must be done in advance. Cut across the corner of the Tiergarten, the former private hunting grounds of the Kaiser, to get to the Brandenburg Gate. This is one of the most famous Berlin sights. 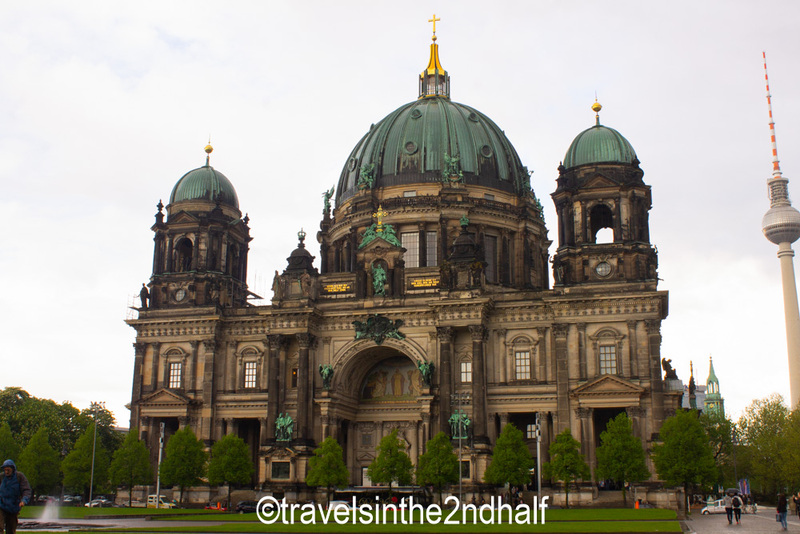 Finished in 1791, it was built to represent peace by Emperor Frederick William II of Prussia. The gate was closed off by the Berlin Wall, and it served as the background for speeches by John F. Kennedy, Ronald Reagan and Barak Obama. As you walk through the Brandenburg Gate, you will enter Pariser Platz. It is kind of a cross between Times Square and Union Square in New York City. It is crowded with tourists, and people hawking “free” walking tours and pedicab rides. It is also a gathering spot for political rallies. 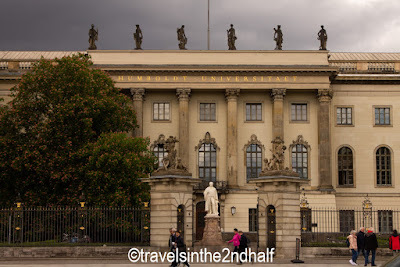 Your walk continues east along Unter der Linden, a wide boulevard, with heavy traffic and many shops, most of them touristy, along it. You will pass the massive Russian embassy, which dates back to the days of East Berlin, with the obligatory Aeroflot offices attached. 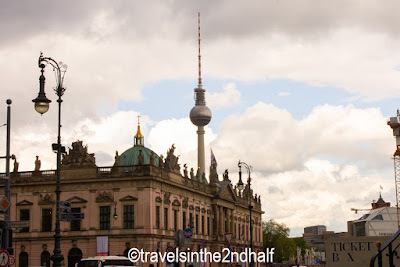 Keep on walking and you will arrive at Friedrichstrasse, Berlin’s shopping district. Along this street you will find department stores and boutiques offering clothes and other goods. From H&M to Lacoste to Gucci, if fashion is your passion, this is the street to visit. Continuing east you will arrive a Bebelplatz. This open square is bounded by Humbolt University and the State Opera House. Today it is named after one of the founders of the Social Democratic Party in Germany, but in the 1933 it was the site of one of the most infamous Nazi book burnings. 20,000 books were set ablaze. 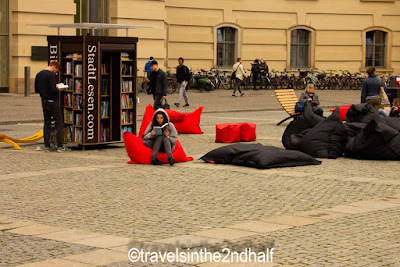 There is an official memorial in the plaza, but to me, the fact that I encountered a pop-up outdoor bookstore, complete with giant bean bag pillows to sit on, says a lot more. 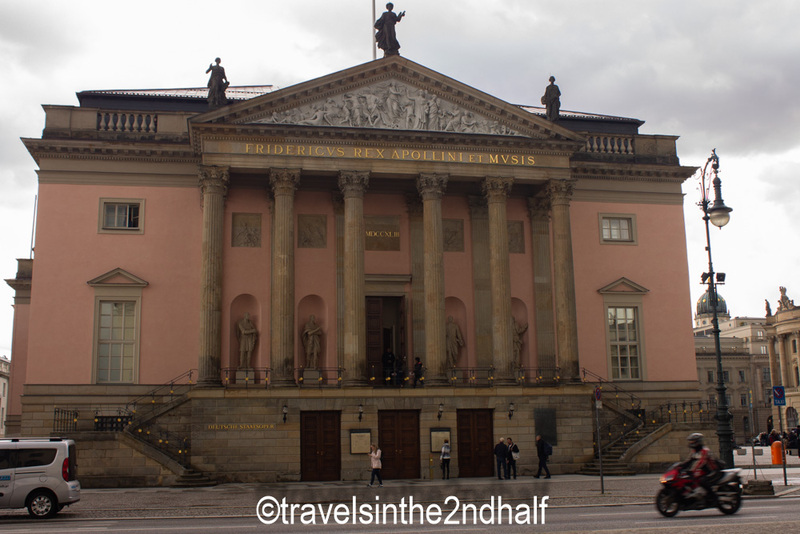 As you walk on towards the Spree River, you will find the Neue Wache. Originally built in 1816 to serve as a guard house for the city. It was severely damaged during World War II, and in 1957 the East German government rebuilt it as “The Memorial to Victims of Fascism and Militarism.” An eternal flame was installed over the tombs of an unknown soldier and a concentration camp victim. 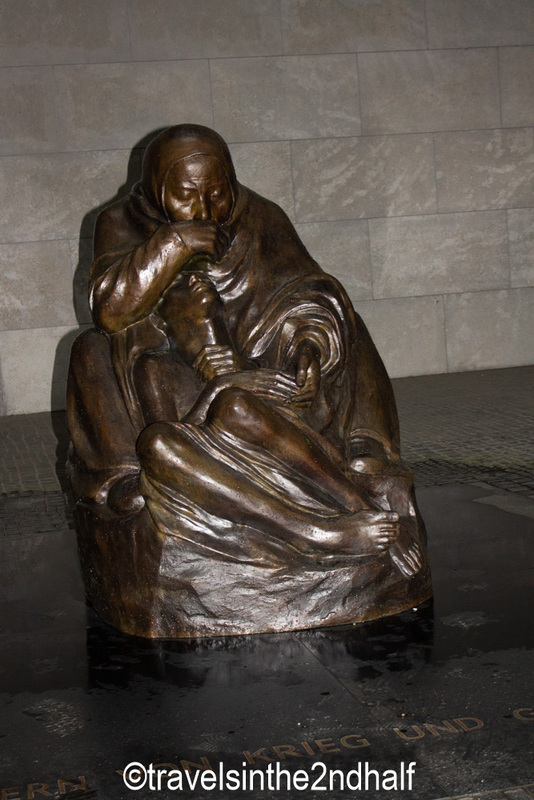 After reunification it was renamed “The Memorial to Victims of War and Dictatorship.” The flame was removed and the statue Mother with her Dying Son by Käthe Kollwitz was installed under an oculus, to represent the suffering of the common people. You can read my blog about the Käthe Kollwitz Museum here. Crossing the Spree, you arrive at Museum Island, a complex of six museums built in the early 1800’s. They house the part of the Berlin State Museum that represents art from around the world, dating from before 1800 ACE. 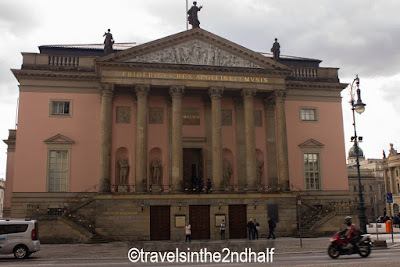 The buildings were constructed under the auspices of Kaiser William Frederick IV. The collection continued to expand through the 19th century, and in 1918, they were turned over to the federal government. Again, I will have a full review coming up in a future blog. Leaving Museum Island, if you follow Inter der Linden you will find Alexanderplatz, a major shopping area, and home to the iconic TV tower. I, however, turned left (north) and arrived at my destination – Herkasher Markt. I came looking for sustenance, and I had a plethora of choices. The center of the market square is filled with restaurants aimed at tourists, large, with lots of out door seating, and familiar menus. Walk along the streets and leading away from the square and you will find more choices, with a wide variety of cuisines. This time I opted for Restauration 1840, touristy and large, but they had the large salad and grilled chicken that I was looking for. The area hosts a craft and food market and is a center of nightlife in the city. This walk, only one-and-a -half miles can be done on a couple of hours, or you can take several days, depending on what you want to see and do. I returned to different parts of this walk during my week in Berlin. Either way, it offers a good introduction to this fascinating city.